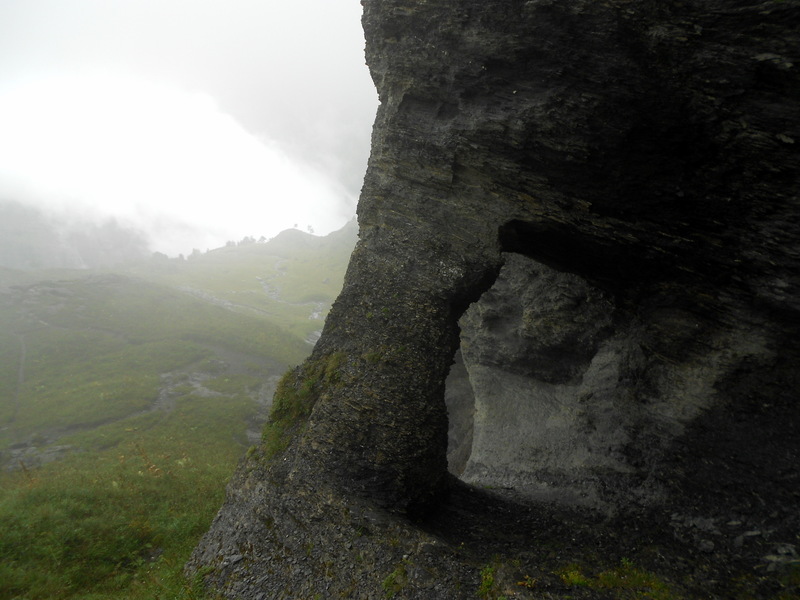 Technically, things get interesting after a mile or so : follow the path signposted up the cliff, towards refuge Vogealle. 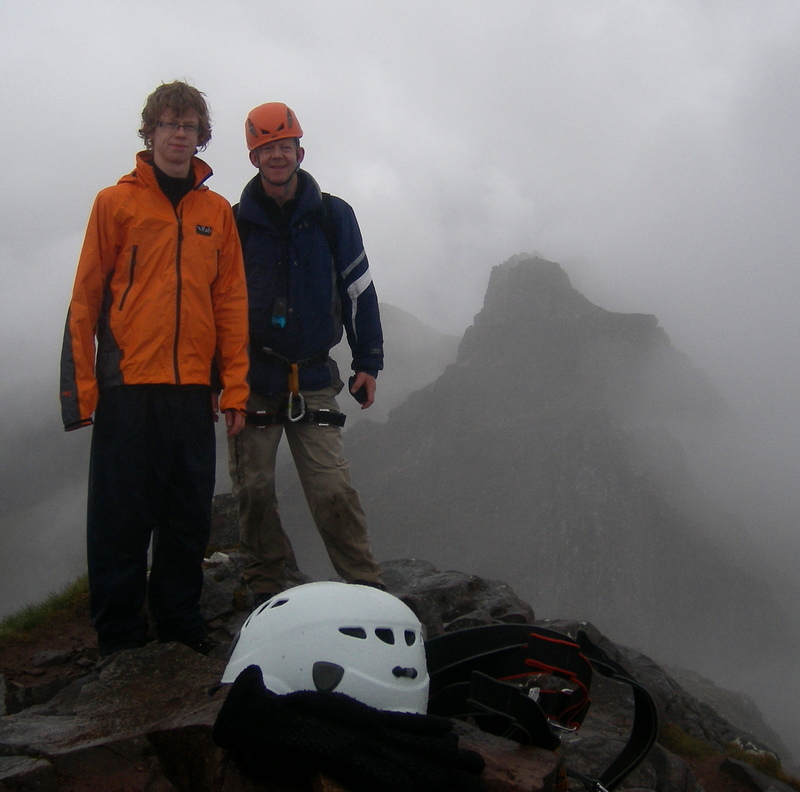 The first section, climbing up and across a rock face is the most difficult in terms of both route finding and scrambling. Although there are red arrows painted on the rock, we ended up on a couple of dead end ledges before eventually finding our way up and over the slabs. Continue up the steep path, helpfully provided with lots of fixed ropes where there is any danger of a slip, until after about 200m of climbing you reach the tree line. From there on, the path works it’s way through the woods and up onto the open hillside, climbing up to the Chalet du Boret at 1,380 metres. This is the first of three very welcome chalet / refuges on this route, all being excellent places to enjoy a morning cafe, or later on an afternoon ‘chocolate chaud’. 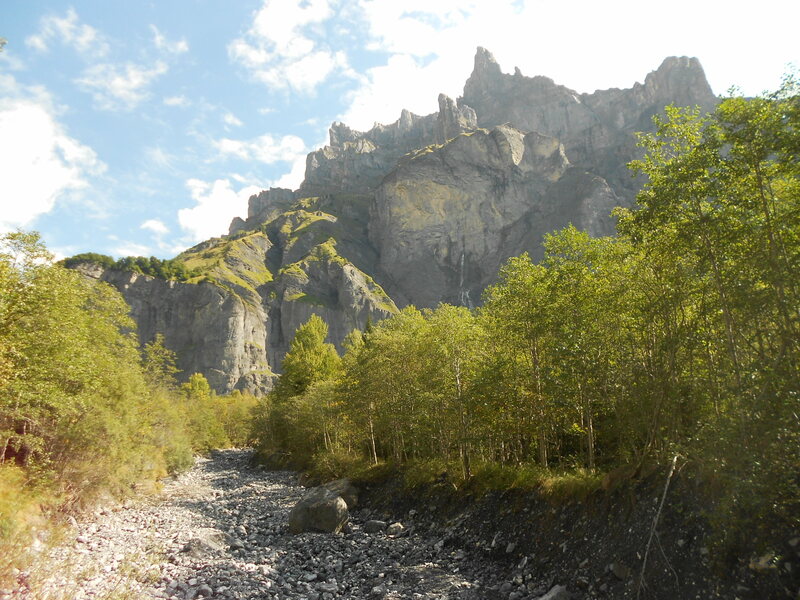 From the chalet, the path meanders up towards the rock face, skirting round to the south before climbing up through an increasingly rocky mountainside, with huge cliffs towering above you on your left. Watch out for the rock arch at this point, a great, if slightly precarious, photo-op! As you reach the top of this section, the roofs of Refuge de la Vogealle appear in a clearing in the rock, prayer flags fluttering in the inevitable breeze. The path now rises towards an obvious corrie – though on a pretty huge scale. The blue-green waters of Lac de la Vogealle sit in a spectacular amphitheatre of rock, with the white capped peaks of les Dents Blanches to the north and a ring of jagged mountains rising to 2,700m to the south and west. If you’ve resisted the temptation of lunch at the refuge, sitting on one of the table-top rocks and looking at the 360 degree view just has to be the ultimate picnic location. The path then rises north west, picking through the steep sides to emerge at the highest point on the walk, at over 2,400 metres (7,800′ ). 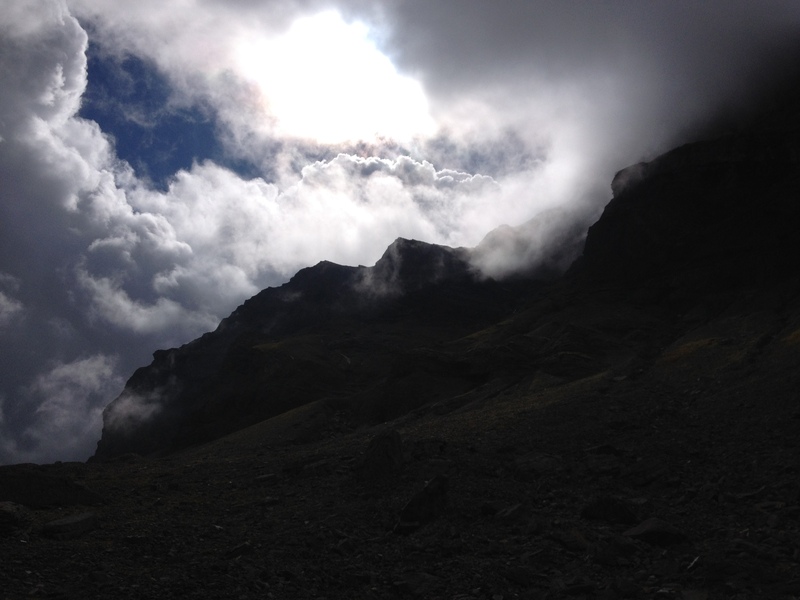 As we climbed out of the corrie, we heard the first rumblings of thunder, echoing loudly in the enclosed space. As the sky darkened, the rain started – soon turning to a heavy hail storm as we tried to find shelter. 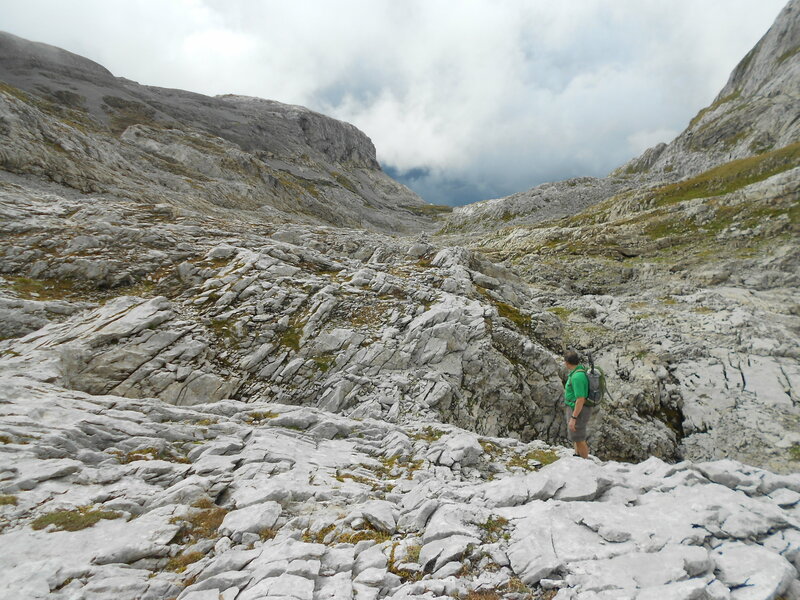 The next section is probably the oddest and most spectacular walk I have ever encountered. For the next couple of miles you are picking your way west, through what I can only describe as a massive limestone pavement. In reality it feels more like picking your way across a crevasse-ridden glacier of rock, with thousands of holes falling away to depths of 50′ of more. It’s really fun to try and find a path through this, roughly following a trail of cairns that people have laid to help you navigate this sea. Amongst the rocks, hundreds of beautiful flowers cling to the shallow soil, contrasting sharply with the bare rock moonscape all around. 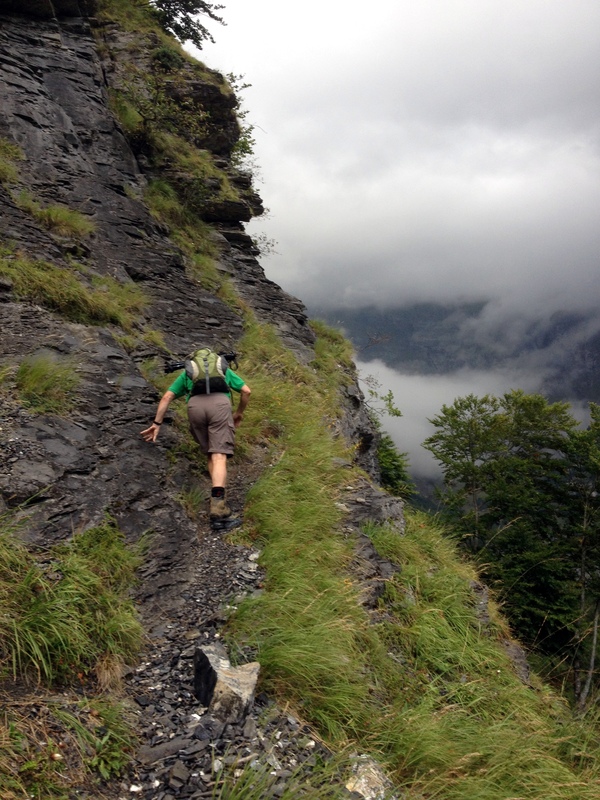 All too soon, the pavement ended and we started the long descent down towards the distant valley and samoens. 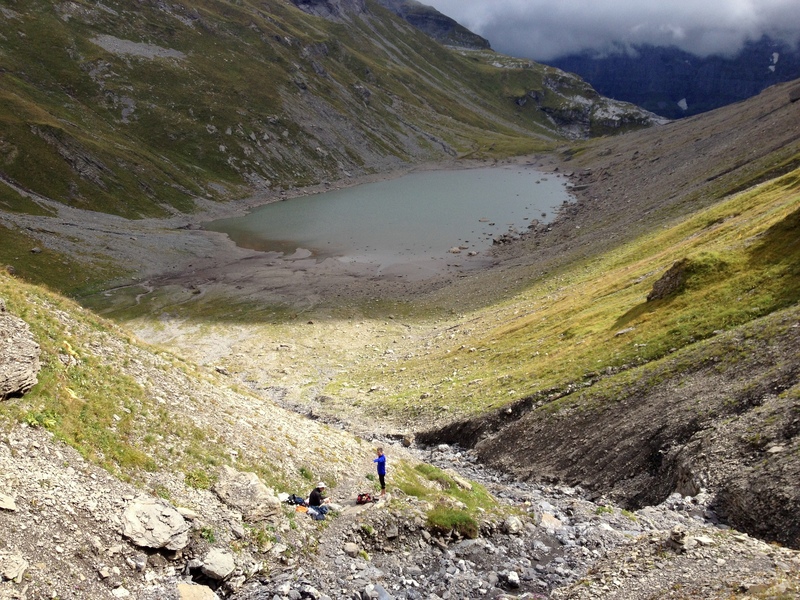 The walk out is much further than it looks, dropping over 5,000′ to the valley floor far below. Apart from the great views though, the knee-jangling descent has one last bonus : the well stocked Refuge de Folly, serving the best bowl of ‘chocolade chaud’ I have ever tasted! Energy levels boosted, we continued down, to arrive at last in the village of Samoens. At 19 miles and 5,000′ of climbing, this is a long day out in the mountains. 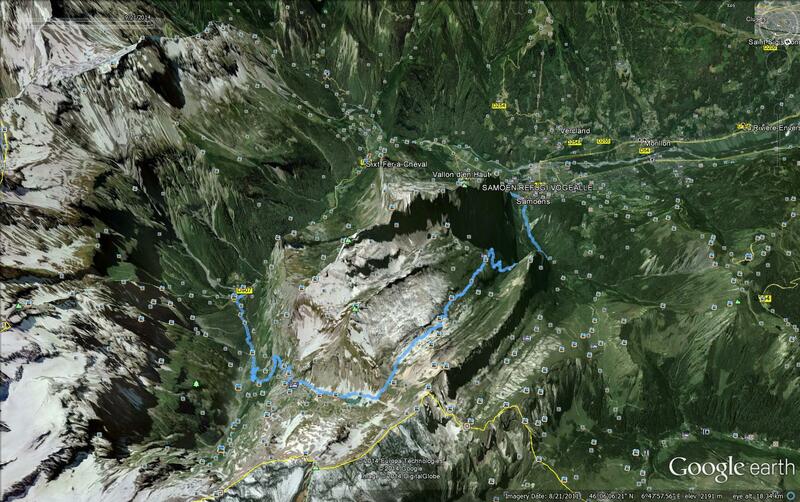 But if you want an alpine adventure which lasts long in the memory, then this route is the route which delivers. Epic! This entry was posted in Alps and tagged Chalet du Boret, Dent Blanche, Haut Savoie, Refuge Vogealle, samoens, Scrambling, Sixt fer a Cheval. Bookmark the permalink.